One of the key findings of the International Panel on Climate Change was that climatic extremes (droughts and floods) are predicted to increase in severity and duration as the climate warms. Such changes are predicted to impact biodiversity substantially, particularly in modified landscapes. A pivotal question is can land management ameliorate the impacts of climate change extremes on biodiversity in modified landscapes? Answering this question requires studies with two rare attributes. First biodiversity must be monitored through an entire climatic extreme, allowing sufficient time to document recovery. Second monitoring must occur across multiple independent landscapes in order to relate biodiversity change to differences in landscape structure. Document the extent of recovery of regional avifauna six years after the breaking of the extreme drought by re-sampling the original 240 sites within the 24 study landscapes. 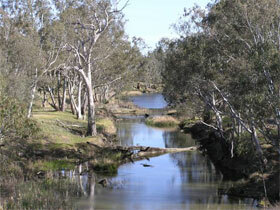 The study area encompasses 20,500 square kms of north-central Victoria. Nimmo, D.G., Mac Nally, R., Cunningham, S., Haslem, A., Bennett, A.F. (2015). Vive la resistance: reviving resistance for 21st century conservation. Trends in Ecology and Evolution. This research will address one of Australia's most pressing extinction crises: the rapid decline of south-eastern Australia's avifauna and of woodland birds in particular. Unaddressed we may see a wave of avifaunal extinctions across south-eastern Australia unparalleled in Australia's history. Due to a lack of monitoring data we don't even know the recent trajectory of these communities: are they recovering post drought or continuing to decline? Objective 1 of this project will provide the critical data to answer these questions, which will inform the need for further action to prevent extinctions. At a global scale, Objective 2 will answer a question of fundamental importance to applied ecology in the 21st century: can land managers build landscapes that can enhance resilience of biodiversity to climatic extremes? If the answer is yes, we will provide guidelines for how land managers can manipulate landscape patterns to allow communities to be resistant to the effects of climatic extremes, and resilient following the relaxation of climatic extremes.